It may be surprising to some that viruses are included in the Catalogue of Life as they are often not thought to be alive until they infect their host. It is also not common to think of a virus as a species in the same way we do other organisms. However, what alive means is a debatable, philosophical human construct and is luckily outside the scope of Taxon of the Day today. In the second edition of the Catalogue of Life in 2002, it was agreed that viruses were part of life on earth. What we do know is simply a virus is a small particle that can infect the cells of animals (including humans), plants, bacteria and other viruses. Their genome is made up of RNA or DNA in different formations and they often have a protein shell called the capsid. On its own a virus cannot multiply, but with the help of living cells it is given the energy to replicate. There are currently nearly 2,500 named viruses in the Catalogue of Life and allegedly millions more yet to be described. Viruses are classified primarily by their host organism, particle morphology and its genome type (eg DNA or RNA). There are additional identifiers too but these are the top three. Now on to the taxonomy. One of the best features of the Catalogue of Life is the search and browse interface. You can find a name for an organism in a number of different ways depending on the information you start off with. You can also browse different parts of the taxonomic hierarchy comparing groups from kingdom down to species. 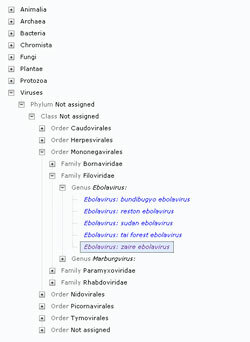 There is no interface, with so many options to access data like it on the web and because of this, it is a quick and easy way to check a virus name, classification, browse different groups and print off species lists within the virus hierarchy. Like other kingdoms in the Catalogue of Life virus taxonomy is particular to its own taxa including its own set of nomenclatural rules. The Global Species Database of viruses is supplied by the the International Committee on Taxonomy of Viruses (ICTV) which since its inception in 1962 has become the singular authoritative source on virus taxonomy. It is run by a group of expert virologists where any new viruses that are named or need to be classified must be approved by the ICTV Executive Committee. Unlike some of the other taxon groups in the Catalogue of Life, it all seems rather uncomplicated. A 'universal taxonomy of viruses' it doesn't get much clearer than that. In practice it is similar to other biological classification systems, as the ICTV recognises the ranks of order, family, subfamily, genus, and species. It does not recognise ranks above order and it does not concern itself with taxa below species. So whilst strains, variants, types etc are the interests of many a virologists and where known are assigned to species, in the classification system they do not have a recognised rank. For simplicity and unification between other kingdoms the Catalogue of Life supports all used ranks of the ICTV with the exception of subfamily. In addition, because the Catalogue of Life supports the binomial naming of species - where genus and species epithet make up a name it is different to virus taxonomy, where the species name is just the species epithet name (in the Catalogue of Life). For the user of the Catalogue of Life this is not so important as all the essential information is there just displayed slightly differently than you may find it in the ICTV database. For example the taxonomy of two well know viruses found in the Catalogue of Life. Where species name in CoL is written as Ebolavirus: zaire ebolavirus ICTV where the colon is an indicator of the differing taxonomies. However to a virologist or probably anyone else, you would say 'human immunodeficiency virus 1 is a species of the genus Lentivirus of the family Retroviridae'.